Our Rough Water Pedestal fish Cleaning Station Comes With Water Bib, Aluminum Hose Holder, and a Knife and Plier Holder. Fish Cleaning Station Comes With an Attractive White Powder Coated Finish. 40" x 23" x 1/2" thick White Starboard Fillet Surface. This Fish Cleaning Table Can Be Shipped Via UPS. It Comes in Two Pieces - Just Place The Starboard Top on the 4" Square Pedestal. The 4 S/S Screws Secure the TOP on Perfectly Every time. 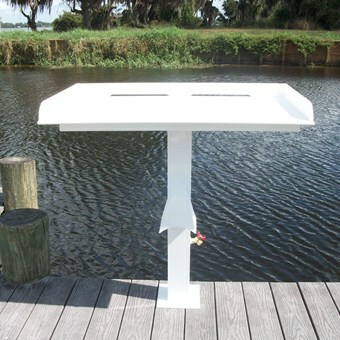 An 8" Square Aluminum Base and 4 Mounting Holes Hold the Table Securely Onto Any Dock.